My European adventure resumes on the morning of August 8, 2017. After breakfast, I started my tour of Helsinki at Kiasma, the museum of contemporary art. Though I will attempt to describe the exhibit, the installations must be seen to be appreciated. I will say this, though: my mind was blown. The theme of the exhibit was how social media is changing what it means to be human. There was one installation which included poetry generated and read by a neural network. There were videos documenting the lives of fictitious social media celebrities, stories detailing the impact of social media on identity, physical installations of monitors and wiring which spoke to how our perception of the world is affected by social media and how computer waste pollutes the environment and endangers workers who sort and extract precious elements from hard drives and other computer parts. I emerged from Kiasma in a kind of daze to be confronted by a peaceful and small demonstration by young refugees who didn’t want to be deported. I had been told that the Hop-on, hop-off bus tour stopped at Kiasma. It was on the map the desk staff at the hotel had given me. I couldn’t find a sign anywhere near the museum that would indicate a stop, though. I waited, thinking that I could flag down the bus when it did stop, if it was anywhere near. The driver of the first bus I caught up with informed me that there were two hop-on, hop-off bus tour companies and that my ticket was for the other one. He directed me to the proper stop, and I crossed Mannerheimintie to wait again. I was understandably confused (and not a little frustrated) when, upon boarding the second bus, I was again told that my pass was for the other company. Once more, I crossed the street and waited. Thankfully, the third driver accepted my pass and gave me the proper map and a set of headphones. By this time, it was again after noon and having caught the bus near the end of its route, it wasn’t long before we passed Stockman’s (the Finnish equivalent of Macy’s or The Bay), the Esplanade (a lovely park and Market Square leading to the waterfront), and stopped at Senate Square. The next tour would depart in 20 minutes. I took advantage of the stop to take a few pictures and try to find a public bathroom. Another toilet story for you 🙂 Most public bathrooms in Helsinki are pay per use. Unfortunately, I didn’t have the right change to access the one I found. I didn’t have the time to have a meal and use a restaurant bathroom, and so I scouted around until I found what looked to be a free public bathroom. Let’s just say that in the future, I determined to have two and five Euro coins on me at all times. Enough said. The two and a half hour hop-on, hop-off bus tour took us past the Uspenski Cathedral, ferris wheel, heli-port for flying tours, and the Market Square (again) and then down the peninsula. We passed the Olympia Terminal, Mannerheim Museum, Kaivopuisto Park, and through the Eira neighbourhood, featuring homes with Jugend, or Art Nouveau, architecture. We then made a detour down to both cruise ship terminals to drop off passengers. Continuing the tour, we passed the flea market, the Tennis Palace, and the Natural History Museum on our way to the Rock Church, so named not only because it is made entirely of bedrock, but also because of the concerts that take place there due to the awesome acoustics the Rock Church affords. We zipped on past the Sibelius Monument, the Tram Museum, Olympic Stadium, the Botanic Garden, and Linnanmäki Amusement Park and Sea Life Helsinki, before swinging by Töölö Bay, the National Opera House, Finlandia Hall, the National Museum, and the Parliament building (under construction) until we once more arrived at the Kiasma stop. While I got to see all of these landmarks, I didn’t feel that I’d have time to hop off the bus and see anything, as the tours stopped running at 4 pm and I didn’t want to get stranded. I stayed on the bus until we once more reached the Esplanade, where I got off, had a stroll, and booked a discount ticket (thanks to the bus tour) for the boat tour of the archipelago for 4 pm. I had time to grab a late lunch, see the inside of the Uspenski Cathedral, and shop for more souvenirs at the Market Square before the boat left the dock. The boat tour was great. I sat on the upper level (and got a sun burn) so I could take pictures of all the things. We went most of the way around Suomenlinna, the sea fortress, which is actually five islands connected by bridges. It had everything, including its own church. Suomenlinna guards the Gulf of Finland and Helsinki. The sea fortress was built because of all the naval warfare in the area. The main channel through the area was even protected by huge chains which would be used to prevent ships from passing (like Game of Thrones and Vikings). We cruised by islands used for recreation (camping and hiking), public beaches, summer homes, and many year-round residences. There were lots of sail boats, cruisers, and even a sea plane, which again reminded me of home. There’s at least one resident on Lake Nepahwin that has one 🙂 They fly right over our house when they take off. The animals were camera shy. Before we returned to the dock, we passed Korkeasaari, the Helsinki zoo. It’s on its own island and is the most northern zoo in Europe. After the boat tour, I walked back to my hotel by way of the Esplanade, where I caught the end of what I think was a koto concert. There were two performers plucking large, solid-bodied harps. It was lovely, regardless. When I got back to the Presidentti, I decided to try their “pop-up restaurant.” In the summer months, they offer an evening meal. It was quite good, though not as drool-worthy as Kaarna. Overall, my two days touring around were just enough for me to get a taste of Finland, and to make me want to return in the future. Wednesday would be the start of WorldCon, and that I’ll save until my next instalment, after next weekend’s next chapter update. Until next time, be kind, be well, and stay strong. The world needs your stories! Before I get into my continuing European adventure, I have a more recent misadventure to relate. Last Monday, when I returned from work and turned on my computer, I was greeted with a message: hard drive failure imminent! I consulted Phil, and we proceeded to start up. And the computer promptly shut itself down. So, though he’d had a full day of techie work, my man went out to get me a new computer (he considered a hard drive, but the transferring the data might have taken longer than the existing drive had remaining). I managed to complete an emergency backup of my recent documents and pictures without another random shutdown and I had my full backup from earlier in the month. Hint: back up your stuff people—it saved my Canadian bacon! I was mostly functional by Tuesday evening, but with a new computer, there was all kind of update hell to get through. An hour and a bit of HP updates Wednesday, followed by another couple of hours of Windows updates on Thursday, and then uninstalling the crap I didn’t want, like McAfee. I only sorted iTunes out as of Saturday and the fix isn’t perfect. I have to do a proper export and backup of my music library once I have it completely restored. Apparently saving the iTunes folder isn’t enough. Needless to say, I’m a bit behind. Hence the late “weekend” post. And now, Back to Kiel, Germany. Sunday, August 6th was a casual day. All I had to do was take a shuttle bus to the airport in Hamburg and catch my flight to Helsinki, via Stockholm, at 2 pm. My roommate for the night in Kiel had to leave at ridiculous o’clock to catch her train. She was among a number of cruisers who were taking the German castle tour with Mary Robinette Kowal for the two days between the cruise and WorldCon. I had made my travel arrangements for this leg of the trip through the Canadian Auto Association. The flight, rental car, and bus tour of Helsinki. Any Canadian travellers with a CAA membership? They’re awesome. And they’ll help you wherever you’re headed. After a leisurely breakfast, I broke my last large Euro bill so that I’d have the proper amount to pay the shuttle bus to Hamburg airport. I caught the bus at 11 and arrived in more than enough time to get my boarding pass and … yes, queue up for the flight. The flight itself was fine. Unfortunately, the continuing cruise crud made the journey excruciating. My ears were too clogged to pop properly and none of the tricks—chewing gum, yawning, nose blowing, holding your nose and blowing—worked. But I landed safely and the greatest part of the pain was relieved. Fun fact: they play bird song in the Helsinki airport bathrooms. Outside, I grabbed one of the waiting taxis and asked to be taken to the Sokkos Presidentti. This is the hotel from the outside, and directly across the street was a Zoological Institute with these two (yes, those are giraffes) having tea on the upper balcony and this one moose standing guard below. I felt at home already. My room was more rustic than tranquil, but I’d made it to Helsinki and wanted to rest up for my next two days of adventures. In the morning, I grabbed my usual European breakfast, bacon, eggs, muesli, and fruit, with coffee and juice. It sounds like a lot, but I was feeding my cold and needed energy for the day ahead. That day was the day I was going to find Marttila, Finland! An old railway becomes a pedestrian (and bicycle) underpass. Commissioned graffiti. And that green? Geraniums. Smells peppery and awesome in the morning, or after rain. Despite the directions of the desk staff, it took me over an hour to find the car rental place. When I checked in, I confessed my doubts that I would be able to competently navigate out of and back into the city. Without a pause, the lady at the counter rebooked me for the airport location and advised me which train to take to get there. The people at the train station were very helpful, too. This first journey out to the airport, another traveller sat across from me and shared her adventures. She was an American and I have to confess that I don’t remember her name. I’m horrible at remembering names. She’d been laid off with severance the year before, and decided to see the world. At the airport, I found the car rental counter and got the keys to my car, actually a crossover. I can’t remember the makes or models of cars, either. But it was white and clean, and comfortable. I spent a few minutes chatting with the two young men there. I’d Googled the directions, but wanted a back up. They gave me a map and marked out my route, and I was off. Sort of. European vehicles, even automatic ones, are sufficiently different from North American ones that it took me a few minutes to figure out that I’d even turned the car on. They’re all hybrids. Once on the highway, I relaxed. Driving soothes me. And once out of the city, the landscape reminded me so much of northeastern Ontario, I could have been driving on the 400 North. Except for the tunnels. There were a lot of rock cuts where the granite had been blasted away, but, I guess there were criteria. If the rock was so high for so long, they’d tunnel through rather than blast. So there were seven or so tunnels and at least one of them was several kilometres long. Call me a troglodyte. It was amazing. I turned off the main highway onto smaller and smaller roads and, eventually, I found Marttila. The land around the town was all farmland. It reminded me more of some of the towns on Manitoulin Island. I saw what might have been a school, or a library, a grocery store, where I stopped to pick up some snacks for the road and ask if there was a place to eat and maybe a restroom I could use … ? More wandering around and I found the little lunch place where I had a Panini and coffee. I tried to explain what I was doing there to the girl behind the counter. I’m sure she thought I was crazy. I’m sure there was more to see, but I did want to get back to Helsinki for supper, so I reversed my search on GoogleMaps and navigated back to the airport. The train ride back was uneventful and I talked to the desk staff again to get a recommendation for supper. She sent me to Kaarna. I don’t think I’ve ever eaten anything more delicious than reindeer sirloin. I’m drooling just remembering it. And Kaarna paired all of their entrees with tasty bevies. The Tin Soldier cider they recommended enhanced the flavours perfectly. And that’s where I’ll leave you for this instalment of the journey. I really thought I’d pack more into this post, but there you have it. Next weekend—and it should be on the weekend, this time—I’ll cover my tour of Helsinki. Then, it will be October, and time for my next chapter update. I’ll resume with my WorldCon experience the weekend after that. So stay tuned, there’s more to come! Until next I blog, be well, be kind, and stay strong. The world needs your stories. Here’s a bundle of stuff to get the mental corn popping. I listened to this interview last Sunday—so good. And so important. Michael Enright interviews Daphne Merkin about staying alive despite her near-constant wish to die. The Sunday Edition on CBC. ASAP Science explores memory. Can you remember this? SciShow asks, can you be allergic to sunlight? Oh, yeah. Elephant conservation is more important than you think. Samburu for The Economist. Be well until the weekend! SOS Safety Magazine lists four signs of a person with high-functioning depression. This is me. ASAP Science shares seven ways to reduce your stress right now. A wee clip from Michael Moore on Finland’s school system. Gaze in awe at these colourized photos of Russian women snipers, who terrorized the Nazis in WWII. Julian Robinson for Mail Online. And your kawaii for the week: Ozzy, the desk weasel. See you Saturday for my wrap up post about Writing the Other. Tasty, tasty! Be well until then, my friends. A little silly, a little serious, and a whole lot of inspiration. Curated just for you! It’s okay to be smart: why are we the only humans left? Hearst Digital Studios produces a powerful #survivorloveletter, from survivors, to survivors. The Oatmeal: you’re not going to believe what I’m about to tell you. About awesome brain science-y stuff and your power to put your amygdala in it’s place. Just because it was May the 4th (be with you): was Star Wars really in a galaxy, far, far away? Phil Plait, Bad Astronomer, for Blastr. Stanley the singing Airedale talks to his mom on the phone. And that’s how we pop your mental corn. Just a wee reminder, I’ll be away this weekend, and so I’ll see you next Tipsday with a new batch of informal writerly learnings. Be well until then, my writerly friends! This week, I thought I’d write a little bit about genealogy. I’m not going to post any of my family trees (I have three, though they’re incomplete and slightly out of date) … I’m just going to write about the wonderful things you can learn when you do a bit of digging. The first is this: genealogy is one of the duties of the bard. Whether you think of a bard as a bard, or filidh, or ollamh, a bard wasn’t just a collector of tales, a memorizer of songs and poems, but they also held the responsibility to guard the family history and bloodlines. They were scholars, doctors, law-givers, and just darned cool, and as a writer, I feel that I have some connection to that tradition, and some responsibility for the history of my family. I’m a Celtophile, and unabashedly so (hence the interest in filidh and ollamhs), but the family I can trace is Finnish. Yes, Marttila is a Finnish name. You can generally tell because of the three consonants together. That, or the double vowels (e.g. Saarinen) are pretty clear give-aways. The larger family name in my genealogy is Wiirtanen. There is a large Finnish community in the Sudbury area, many of them coming from the Long Lake area of town and the Pennala subdivision there. That’s where the Wiirtanens settled. One of my Wiirtanen relatives still lives out at Beaver Lake, a bit of a drive out of town. He’s a trapper and owns a farm. Other Finnish families moved into town around Lake Nepawin (Maki Avenue was named after one of them) and there have been a few books published on the Finnish roots of Sudbury. A number of years ago, a genealogist visited me out of the blue. I sat with him for a few hours in an afternoon and he taught me a few things about my family, which happened to be part of his family tree, which is why he looked me up. In Finland, at the beginning of the last century (give or take a few years) families gave up their names, and took on the names of the farms or cities where they worked. Notice the image on the crest: It’s St. Martin of Tours cutting his cloak in half to give to a beggar. 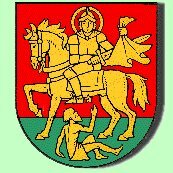 So Marttila roughly translates to St. Martin, not a particularly Finnish icon, but at least I know where my family name comes from. So I started keeping a few files on my family tree. Something else I did was to look into the kalevala, the national epic poem of Finland. It’s a creation myth, set of legends, and features magicians and the mystical sampo, which could be, among other things, an analogy for an instrument that could track the precession of the stars. My mother was adopted and has no interest in looking into her family, so I’m kind of stumped there, though she tells me that she was Irish, something my grandfather liked to tease her with. So maybe there’s a reason, I’m so enamoured of all things gaelic. Have you delved into your genealogy? What did you discover?